Excerpts from the book, in plain text, a GIF image, and a PDF file. Also included is an image of one of the six plates of figures from the book. A closer look at the cover, with some details about the surveying instruments on the front and back. Comments about the typesetting. The book is printed in a font that was developed to explicitly match the original text. Research pertaining to the book. How to order a copy, direct from the publisher, from an online bookstore, or from your local bookstore. Contact the publisher or the author of the notes. The Practical Surveyor is an instructional book on how to perform field surveys. This is not a textbook, but, as its title suggests, a practical guide. 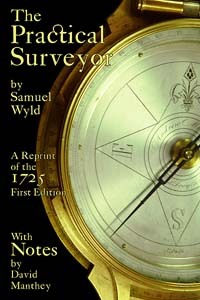 It includes descriptions of the tools of the trade, explanations on how to use the equipment, a detailed account on keeping field notes, instructions on drafting the results, and techniques for calculating the area and other quantities of the surveyed land. In this small Tract you'll find the whole Art of Surveying Land Epitomized: The Rules and Methods here laid down in a plain and familiar Manner, being such as are fittest for a Practiser's Use, without an unnecessary Mixture of useless Curiosities and needless Repetitions. And altho' Brevity be chiefly intended, yet nothing is here omitted, but what might well enough be spared in a Treatise that immediately relates to Practice. Although The Practical Surveyor was written over 275 years ago, there is still much that will interest the modern reader. From a historical perspective, these are the methods that were used when surveying lands in Great Britain and early America. For the surveyor, there are some techniques that are on the verge of being forgotten in our electronic age, some of which still have utility in the field. For someone without experience in surveying, this text is an excellent introduction, as it explains the methods and instruments in a plain and ready manner. A set of modern notes provides translations to the few Latin phrases found in the book, some corrections to the original text, and commentary on the accuracy of the methods. Additionally, updated astronomical tables are provided for use in finding true north using Polaris. There is also a list of all of the surveying instruments that are mentioned in the text and a lexicon of words.